Kontakt offers a comprehensive set of sample player / sound manipulation features, extensive flexibility and performance and a high degree of compatibility. From authentic library playback of virtually any format to the intuitive creation of new instruments, from profound sound design to lively and dynamic surround sound mixes - Kontakt opens the doors to creativity. Kontakt incorporates five different sampler modes, ranging from classic sample playback to real-time pitch shifting, time-stretching and precise drum loop slicing. Ingenious mapping, group and loop editors as well as over 30 filters and effects including Convolution Effects pave the way for fantastic sounds. And the vast modulation section lets you add constant variations. 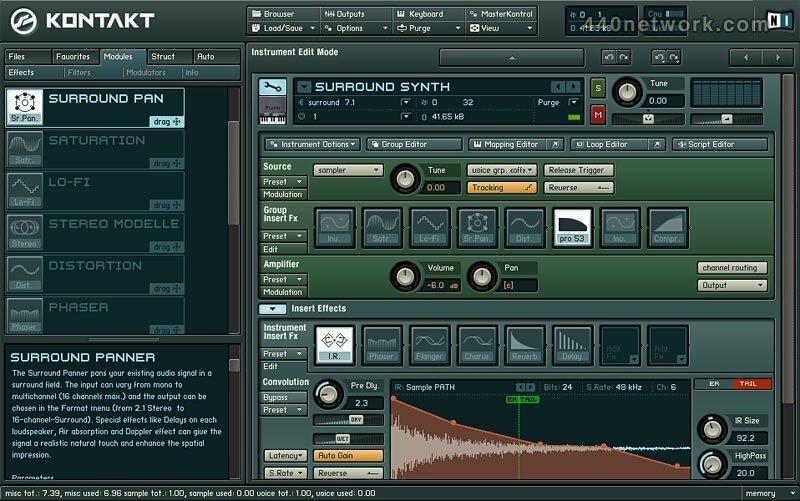 Kontakt offers numerous new features. Create inspiring 3D soundscapes: The powerful new surround sound features offer up to 16 channels of enveloping, spatial manipulation. The Kontakt Script Processor fuses conventional sampling with intelligent MIDI processing and elements of macro programming. Use the included scripts to create instrument simulators and other custom features, such as chord generators or dynamic tuners. Or write your own scripts and witness the power of Kontakt 2's open architecture. Kontakt's modular architecture offers great flexibility. Arrange the modules within the interface to meet your exact, individual needs. Customize the signal flow within Kontakt for unique results. The browser offers a concise overview of your samples, the modules, the virtual rack and more. This invaluable feature distills all essential information into a compact yet detailed summary and by keeping processes transparent, enhances your creative potential. Simply drag and drop the various effect and filter modules, surround panner and modulators displayed in the browser into your virtual rack and create distinctive, individual instruments. 192 KHz, 32-bit sample engine with 64 fold multi-timbrality and unlimited voices. Sample library with more than 15 GB. Brand-new, intuitive user-interface offering dozens of innovative features. Advanced surround sound features allowing up to 16 channel mix-downs. Kontakt Script Processor for profound engine and feature customization. Convolution effect adds real-life reverb characteristics or special effects to the sound. 6 different sample modes: Classic, DFD, Tone, Time I and II as well as Beat Machine. Detailed browser functionality affording a concise overview of essential information. Universal Import ensures compatibility with virtually every sample and library format. Vast selection of effects, filters and modulators. Convenient Group, Mapping and Loop editors for easy use of zones and slicing loops. Bugfix for crash when reloading purged samples in a Group using TMPro. Bugfix for crash when importing a Group with missing samples. Bugfix for other rare crashes. Fixed issue with Vintage Organs. Fixed crash when importing Groups. Fixed issues with Convolution latency compensation. Fixed issue with Loop End using Timemachine. Fixed zipper noise when using CC7 under certain circumstances. Fixed KSP fade out timing issue. Fixed issues with MIDI export to host. The new background loading feature improves your workflow: It makes opening large instruments incredibly fast, enabling you to play nearly immediately - without having to wait for all samples to be loaded. This applies to the stand-alone version of KONTAKT 4.1 and the KONTAKT 4 PLAYER as well as the plug-in versions.